I like this record a lot more than it's probably going to seem based on this review. So I'll try to get the negatives out of the way first and then extoll the positives about The Believer. I hate the 1st song on the album "Tell Me Four Things About Yourself." Just hate it. Unfortunately it's the lead off track and whenever I listen to the record, it starts off in a bad place and has to work to get me back into it. I'm not sure what it is about this song that drives me so nuts. It's probably the endless repeating of the lyrics "Tell me four things about yourself / Three of them true." I assume that's probably a reference to one of those grammar school 'truth-or-dare' type games, but it just seems so nonsensical to me. Anyway skip the first song. What you're left with is actually a very strong album of big hook, crunchy guitar, punked up pop. The songs tend to be upper mid tempo and as a result it reminds a lot of some of the big guitar bands that were getting signed up by major labels in the mid 90's. I'm positive I said this when I wrote about their last album, but I always hear a lot of Fig Dish in the songs. That's absolutely a compliment as I feel Fig Dish just never go their due. From time to time, things get a little too Blink 182-ish for me, but those times are fleeting and I really like the vast majority of this record. It's got great energy on songs like "Confusing Times." 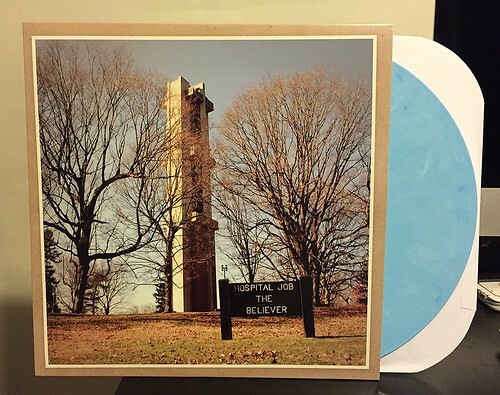 Hospital Job can successfully pull of a slower song without it getting boring or dragging down the record like they do on "The Believer." Though I think of everything on the album, I'm most drawn to the song "Nail Houses." It's just such a great pop song with a killer sing along chorus that has all of those nice backing vocals that get me bopping around. So in summation, this is actually a really great record and one worth picking up. Maybe that first song won't bug you as much as it bugs me. But I think I'm probably just going to put down the needle a half an inch further into the record when I play this guy. Superchunk + Eleanor Friedberger - Live in NYC 7"
Aaron & The Burrs - Release The Bats 7"